The new year is a time to make resolutions for a healthy lifestyle, which often starts with your food choices. Food trends for 2018 lean toward getting back to the basics with all-natural foods. The days of processed foods, preservatives, and chemical additives may be coming to an end, as people turn to healthier whole and organic produce. Diet trends that were popular this year will continue in the new year, alongside new food trends. New year diet trends for 2018 are based not only on knowing what is in the food you consume but also understanding how the animals responsible for your meal were raised and how the plants were grown. Not all food trends are treated the same, and some will offer more benefits than others. By identifying the origins of your food, you can make better decisions about your health and your future. In recent years, the lifestyle trend has focused on health awareness, which extends to the types of food we eat. Last year saw a rise in vegan and vegetarian options at grocery stores, restaurants, and food vendors. It appears that 2018 will continue with this trend. It is expected that more people will turn to vegetables as a primary source of protein, rather than meats. Vegetable proteins are used as snacks, side dishes, and in replacement of pasta and rice dishes. Protein-rich vegetables include Portobello mushrooms, chickpeas, and broccoli rabe, which resembles broccoli but is related to the turnip family. Tofu, quinoa, tempeh, and lentils are also good choices for protein. 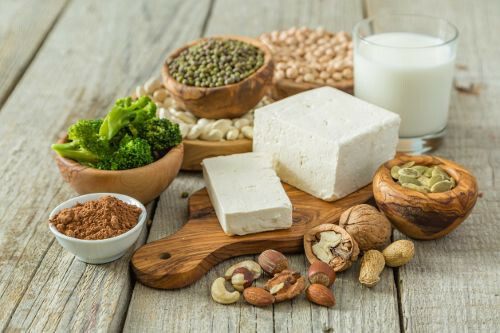 The demand for plant-based products has seen, and will continue to see, an increase in the availability of plant-based dairy products. Lactose intolerance has also added to the production demand of these products. Dairy-free products available on store shelves range from plant-based milks made with cashew, oat, hazelnut, coconut, and non-gmo soy to plant-based cheese, yogurt, butter, and ice cream. Another growing food trend for 2018 may be the use of flavors found in various flowering plants, such as orchids, lavender, and elderflower. Rose and hibiscus are common flowers that are anticipated to light up restaurant menu options, such as teas. Hibiscus has been used for centuries for its reported abilities to lower blood pressure and treat abdominal pains. The flowers and their natural components are used to sweeten cheesecakes, salads, lattes, milkshakes, shortbreads, and gelatin. Alcoholic cocktails are also featuring many of these flowering plants. The practice of using the whole fruit, or vegetable stalk, is another trend. In addition to cutting down on food waste, people are turning to squeezing out as much of the nutrition and substance from the food as possible. Expect to see beet greens, pickled watermelon rinds, and broccoli-stem slaw included in food choices. Other root-to-stem foods to watch for include turnips, chard, potatoes, and carrots. Every year brings a new superfood to light and 2018 is no different. Cacao and maca root are expected to be used to create new recipes to boost both health and natural flavor. Cacao is the purest form of chocolate and has the highest magnesium content. It’s also the top source of antioxidants. Maca root, of the radish family, offers a butterscotch aroma and is used to balance mood, energy, and hormones. The explosion of activated charcoal on the market in ice cream, pizza, and drinks is expected to continue in 2018 as people discover its detox qualities. The use of natural herbs and spices to flavor foods instead of commercial and artificial seasonings will continue into 2018, and probably for many years. This is evident with the growing popularity of tea-flavored products, particularly green tea and other herbal teas. The tea to watch for is made with the moringa plant as its powerful antioxidant components are used to fight inflammation. Moringa has calcium, vitamin A, and potassium. It also offers three times more iron and twice as much protein as spinach. The powder form is now being added to juice, chips, and protein bars. The move to healthier choices is also seeing the reduced use of cooking oils and food products with an oil base. This includes popcorn, French fries, and buttery foods. Clarified butter, commonly known as ghee, offers a lactose-free option to dishes such as scrambled eggs. Its high-heat capability brings out a nutty flavor. An air-fryer will also be seen as a replacement for deep fryers in many homes and businesses. The recent regulations concerning food labels have been met with approval by consumers, as the collective desire to know all the contents and the origins of the foods we eat is growing (pun intended). This knowledge gives customers added assurance of the naturalness of the foods they put into their bodies. In 2018, transparency will be as important as ever, with more food products on the shelf, as well as on menus, seen with symbols designating calories, GMO-free, Fair Trade, cage-free, grain-fed, and pasture-raised. Experimenting with combinations of food is a trend that is expected to continue well into 2018. Until recently, hybrid foods referred to cross breeding plants to discover a more nutritious product, or to find a plant resistant to crop disease and unappealing to insects. Mixing two or more foods together is considered the new hybrid food. With the competitive business of food companies, and among vendors, hybrid food is a popular craze. This also is boosted by the move to be the first to Instagram the latest combination of donuts with milkshakes or espresso-soaked ice-cream waffles. The new year may see the emergence of the newly developed meat alternative technology called “heme.” This will give not only the taste of beef to plant-based meat but also the texture and look. Whether the chosen foods are meant to improve health, help lose weight, or to sustain a healthy lifestyle, 2018 may see an array of options. We have opted to cover the most popular-growing trends for the new year. Clinical studies show that a healthy gut (gastrointestinal tract) provides defense against disease and promotes brain functioning. These results may point to consumers becoming more food-conscious. Probiotics found in kefir, kimchi, kombucha, and miso, as well as the prebiotic foods garlic and onion, are growing on the demand list. Returning to the traditional food preparation of pickling, preserves, and fermenting will be more popular in 2018. One of the commonly used fitness, and diet, food plans is intermittent fasting. In addition to weight loss, this type of plan is also popular to “balance” the body to a better state of health. Often called an “eating pattern,” intermittent fasting refers to cycling between fasting and eating times with 16- or 24-hour fasting periods at least twice each week. This year saw a surge in people of all states of health turning to a ketogenic diet. This meal plan entails weight loss based on high-protein, high-fat, and low-carb diet. The restriction of certain foods promotes an increase in the production of ketones, which is the result of fat breakdown. To reach the state of ketosis, carbohydrates consumed should equal a total five percent of daily calories. Foods to eat include high-fat dairy products, eggs, red meat, poultry, fish, low-carb vegetables, and healthy fats. Foods to avoid include fruits, grains, starchy vegetables, and sweet treats. This diet trend among Hollywood’s elite claims to balance the pH levels of the body by eating certain foods. While the diet is growing in popularity, it is important to note that it’s the type of foods, not the blood pH level changes, that promote weight loss. The alkaline diet calls for nuts, fruits, vegetables, and an abundant water intake. Processed foods, grains, red meat, eggs, dairy, alcohol, and sugary products are taboo. Flexitarian refers to a plant-based diet that allows the casual consumption of red meat. It was created from the words “vegetarian” and “flexible.” There are no guidelines as it is as flexible as the individual. Followers can eat meat once a week, once a month, or somewhere in between. More and more people are expected to follow this trend in 2018, as it offers a balance between a traditional food diet and a strict vegan one. As people search for unique foods to help promote healthy eating, the popular choice is turning to the foods of other cultures. Every day, there are more and more restaurants and shelf products offering lesser-known cuisines from foreign nations. With seafood as a staple for many healthy diets, there may be more demand for main dishes from the Arctic sea. Arctic cuisine offers choices to promote gut health with fermented fish and flavorings for plant protein meals. Other exotic cuisines may include foods from the Middle East such as falafel and cardamom spices, and using harissa for cooking. Expect a large selection of Moroccan, Lebanese, and Persian food choices. The new year brings hope for new adventures, luck, more opportunities, wealth, and better health. 2018 may bring you closer to these hopes and dreams with healthier food choices. A healthy new year has many culinary options to explore, regardless of your current state of health. The trend to consume more natural foods with no additives or preservatives appears to be growing with no room for genetically modified foods. Whether food is used to treat or possibly prevent disease, or to encourage weight loss, there is a diet management plan for everyone. Understanding the difference between a passing trend and what works may help sustain, if not improve, a healthy life. “2018 Food Trend Predictions,” Unilever Food Solutions; https://www.unileverfoodsolutions.com.my/en/chef-inspiration/latest-trends/2018-food-trend-predictions.html, last accessed December 13, 2017. Goodman, E., “Foods of the future: 7 trends to watch in 2018,” Chase, December 11, 2017; https://www.chase.com/news/121117-food-trends-2018, last accessed December 13, 2017. Benshosan, A., “Top 14 Food Trends of 2018,” Eat This; http://www.eatthis.com/top-food-trends-2018/, last accessed December 13, 2017. LaGrave, K., “Food Trends: What You’ll Be Eating in 2018,” Conde Nast Traveler, December 12, 2017; https://www.cntraveler.com/story/food-trends-what-youll-be-eating-in-2018, last accessed December 13, 2017. “The Top 18 Trends Of 2018 Are Here,” Well and Good; https://www.wellandgood.com/fitness-wellness-trends/, last accessed December 13, 2017. Cullum, E., “10 Food Trends That Will Be Big in 2018, According to Pinterest,” Pop Sugar, December 13, 2017; https://www.popsugar.com/food/photo-gallery/44356472/embed/44358258/pin, last accessed December 13, 2017. Kowitt, B., “Whole Foods Predicts 2018’s Top 10 Food Trends,” Fortune, November 6, 2017; http://fortune.com/2017/11/06/whole-foods-food-trends-2018/, last accessed December 13, 2017. Licata, E., “The 10 Biggest Health Food Trends of 2018, According to Natural Grocers,” The Kitchn, December 7, 2017; https://www.thekitchn.com/popular-2018-health-food-trends-253564, last accessed December 13, 2017. Land Williams, C., PhD, RND, “Here’s What Our Nutritionist Thinks About 2018’s Hottest Diets,” Cooking Light, November 7, 2017; http://www.cookinglight.com/eating-smart/nutrition-101/top-diets-2018-nutritionist, last accessed December 13, 2017.